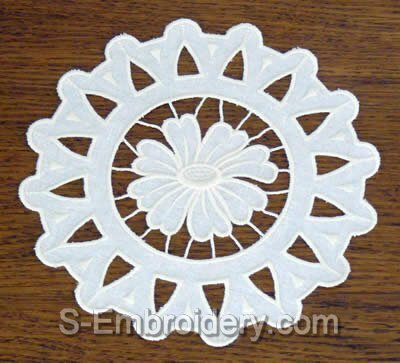 A cutwork lace daisy machine embroidery design. Available in 3 sizes: Small, Large and Extra large. Important: Please note that the large and extra-large sizes are NOT available for all embroidery formats. When choosing the size option you will want to make sure the design will fit in the working area of your hoop. Available in ART, DST, HUS, PES, JEF+ and VP3 machine embroidery formats. Available in DST, JEF+, PES and VP3 machine embroidery formats.